The deadline is July 3rd so I had to get started on it today. The theme this year is “voices” and the quilts need to be 16 inches square. 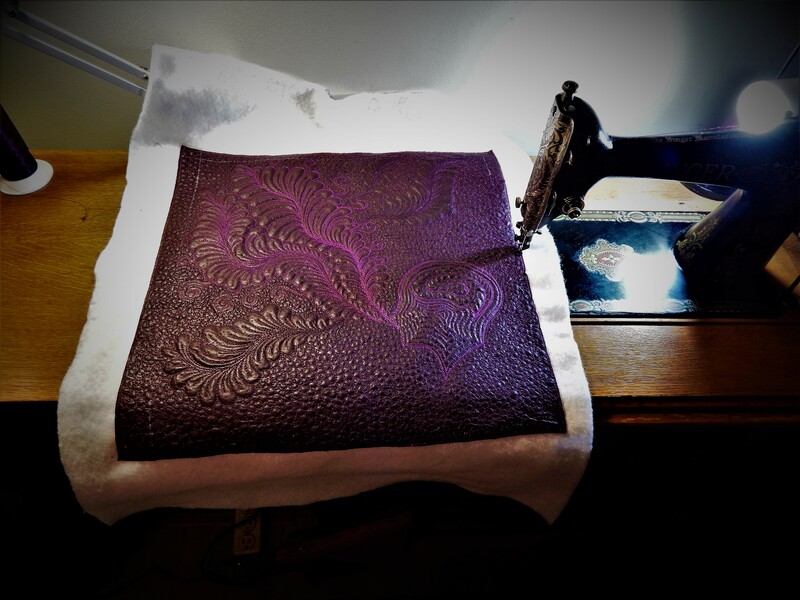 This is leather, quilted on the Singer 66 treadle. 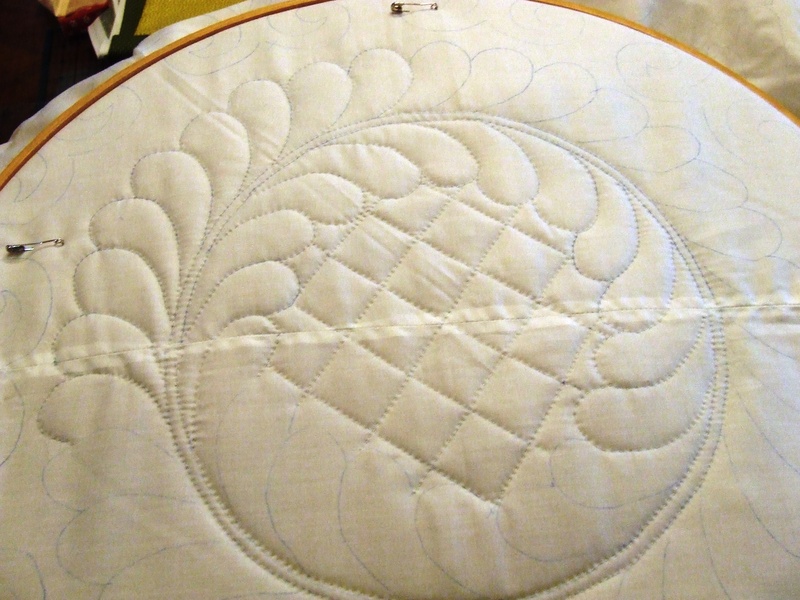 Maybe tomorrow I will have time to start that new quilt I am planning . This entry was posted in Garden, Quilts and tagged Garden, Quilt Alliance, Quilts. You are so clever! Love the play with quilt talk!!! Your flowers are gorgeous (as is the quilts). Do you fertilize them?? This quilt is simply amazing, and your garden…! Dear Tim… such talent and creativity !! !what a blessing to the quilt world you are. And your garden wow!!! Your quilt will be a great addition to the event! Your flowers are pristine! What are those yellow fuzzy banana looking flowers? Holy smokes, the garden is looking awesome! The arbor with the two clematis is jaw dropping. And I love the Veronica/gomphrena/Stacey’s combination too. Don’t know when you sleep? The mini leather quilt is really impressive. How can you get that much detail in leather? Wow. PS My phone does not know how to spell Latin names. You know I meant Stachys. I enjoy popping in and peeking at your amazing work! That quilt is stunning! Your garden flowers are lovely too! I am so happy to hear that you are better and getting your health problems under good control. I guess that is part of what happens as we gain in years and wisdom. I have missed reading your posts and so happy to see your work on the machine and the in the GARDEN! my goodness. You put mine to shame. I love the bag I got from you so many months ago- I feel so lucky to be an early person getting one too these. you are really on to something very very beautiful. thank your sweet Teddy for taking such good care of you. He is avery special boy. Love your leather quilt, Tim! I also like your garden flowers, especially the eremurus. 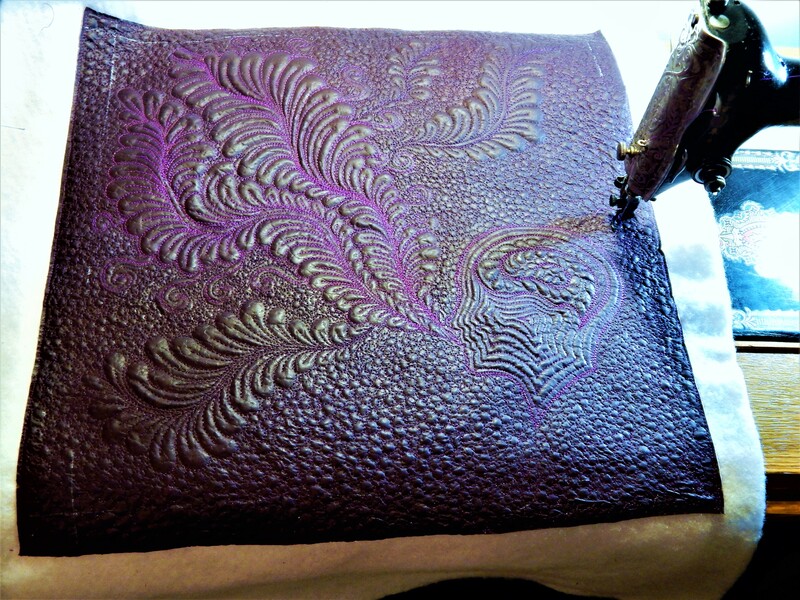 I love the rich sheen of that leather, great idea to quilt it for your entry. Love your and Teddy’s flowers. Clematis are my favorite flower. Do yours bloom all summer? Hopefully mine will. 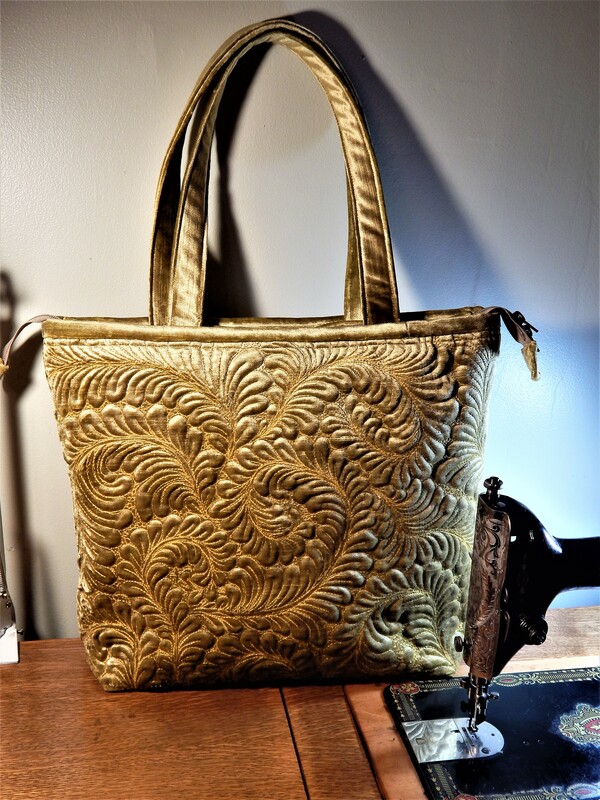 I enjoy your quilting and quilting on leather is beautiful. 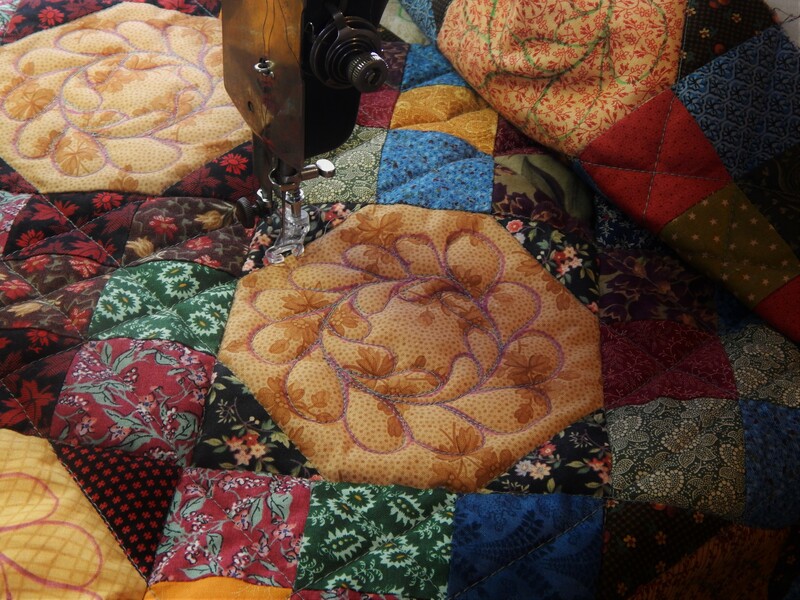 The quilting on your “Quilt Talk” piece is astounding!!! Wow Tim your garden just keeps getting better and better. I lost my clematis in the last couple winters so it’s especially nice to see yours. 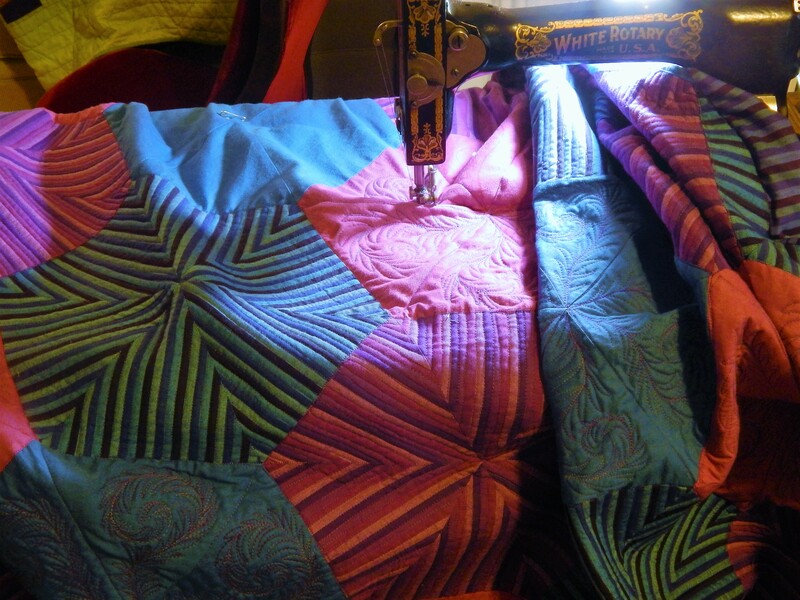 Love seeing your beautiful quilting! Your garden has inspired me to plant some new flowers this year. Your flowers are beautiful and look so healthy. I do have to fight fungus and insects here. not usually a problem here……the fight this year is that it is so dry!